Speech Analytics is the practice of automatically searching audio to understand and analyse what is happening on a telephone call, and then using this insight to improve agent performance and business processes. There are some excellent examples of speech analytics being used effectively by contact centres but more often than not, those who ‘have’ an analytics capability don’t use it to its full potential. It is often included as part of a wider technology acquisition typically added to a call recorder or dialler purchase and in many occasions remains underused. For this reason the adoption of speech analytics within the UK market is as low as 6% nowhere near the expected take up rate that many thought would occur in the sector. Another barrier for many has been the cost attributed to this technology typically running into the £100ks for even a small contact centre. 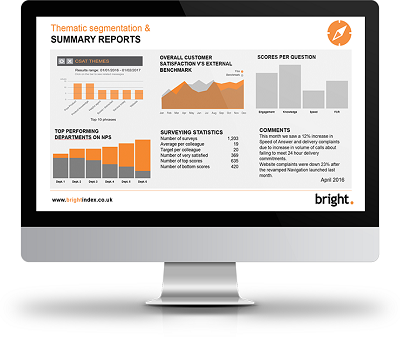 How can contact centres benefit without blowing their budgets? One area which has traditionally been under-used is the collection and analysis of verbatim comments left by customers following a phone satisfaction survey. A number of Voice of Customer tools will capture verbatim comments however many organisations forget or don’t have the capability to fully analyse this information to exploit the true business value. Some solutions are able to provide a list of top 10 words/phrases and a basic word-cloud function. This is a good start and can uncover some surprises and areas to focus on, but to really derive value, more in-depth analytics needs to be performed. Comparing comments from customers who have scored your business poorly for Customer Effort versus those who have given a positive score, and then viewing the words and phrases which occur most frequently in each data set can provide powerful insight into what your customers think. Particularly when searching for an unbiased view of how easy or difficult your customers believe it is to do business with your organisation. Much of what you learn will hopefully be already known to the business, however you may start to uncover new areas of investigation. One company started to see regular verbatim feedback from customers complaining about the sound levels and struggling to hear agents. This was quickly analysed to understand the route cause which found agents had been forgetting to readjust their headsets after their morning cups of tea. A simple fix, which was very quickly resolved. Being able to drill down and view words/phrases not just in isolation but compared to other terms, is equally important. One retailer was surprised to learn that after analysing their verbatim comments the word ‘catalogue’ was being used almost exclusively in negative feedback. Following deeper analysis it was revealed that a small section of its customer-base had not received the catalogue which without the ability to monitor customer feedback may have gone unnoticed. Luckily the retailer in question was able to quickly rectify the situation and avoid the loss of sales and the reduction in customer loyalty. 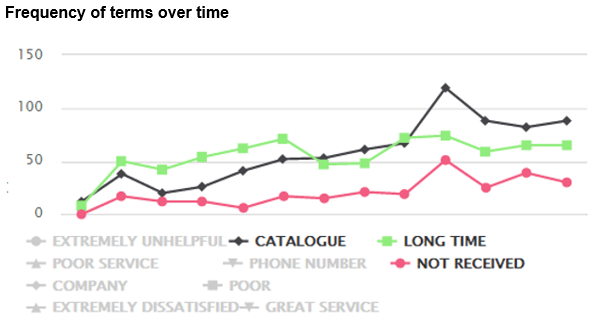 The graph above illustrates this example showing how terms relating to waiting a long time or not receiving a catalogue has a negative impact on customer experience. As with the example above, improvements are not just measured in an improvement in customer satisfaction, there is also often a financial reward when used effectively. Other beneficial areas include regulatory compliance and helping organisations to meet their TCF obligations. Companies can use this process to avoid costly fines and to prove to regulators that they are proactively finding customers with low satisfaction scores and negative comments to address and resolve these complaints. Next Next post: Which agent characteristics are most helpful to the business and how should these be rewarded?